12ft 19 Aluminum AeroCraft Z-12? Trailer has new wiring, lights, and bearings have been greased. Trailer has been painted. Wheels and tires are new. Boat is in great shape, no leaks. Both trailer and boat need nothing. Pictures are from when I purchased it last summer for $600.00. Now stored upside down on its trailer. Comes with set of oars, gas tank, and bill of sale. No motor available. Price is firm at $350.00. My loss is your gain. Need the money. Trailer has new wiring, lights, and bearings have been greased. Trailer has been painted. Wheels and tires are new. Boat is in great shape, no leaks. Both trailer and boat need nothing. Pictures are from when I purchased it last summer for $600.00. Now stored upside down on its trailer. 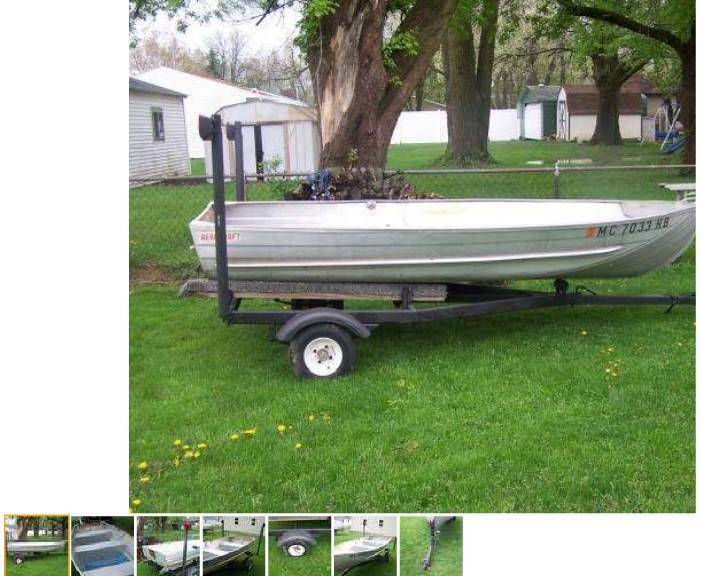 Comes with set of oars, gas tank, and bill of sale. No motor available. Price is firm at $350.00. My loss is your gain. Need the money. No Holds.